Both these options result in your application being provided with an OAuth 2.0 token, which gets attached to each request made to Data Lake Storage Gen1 or Azure Data Lake Analytics. This article talks about how to create an Azure AD native application for end-user authentication. For instructions on Azure AD application configuration for service-to-service authentication, see Service-to-service authentication with Data Lake Storage Gen1 using Azure Active Directory. Your subscription ID. You can retrieve it from the Azure portal. For example, it is available from the Data Lake Storage Gen1 account blade. Your Azure AD domain name. You can retrieve it by hovering the mouse in the top-right corner of the Azure portal. From the screenshot below, the domain name is contoso.onmicrosoft.com, and the GUID within brackets is the tenant ID. Your Azure tenant ID. For instructions on how to retrieve the tenant ID, see Get the tenant ID. This authentication mechanism is the recommended approach if you want an end user to log in to your application via Azure AD. Your application is then able to access Azure resources with the same level of access as the end user that logged in. Your end user needs to provide their credentials periodically in order for your application to maintain access. The result of having the end-user login is that your application is given an access token and a refresh token. The access token gets attached to each request made to Data Lake Storage Gen1 or Data Lake Analytics, and it is valid for one hour by default. The refresh token can be used to obtain a new access token, and it is valid for up to two weeks by default. You can use two different approaches for end-user login. Your application can trigger an OAuth 2.0 authorization pop-up, in which the end user can enter their credentials. This pop-up also works with the Azure AD Two-factor Authentication (2FA) process, if necessary. This method is not yet supported in the Azure AD Authentication Library (ADAL) for Python or Java. Your application can directly provide user credentials to Azure AD. This method only works with organizational ID user accounts; it is not compatible with personal / “live ID” user accounts, including the accounts ending in @outlook.com or @live.com. Furthermore, this method is not compatible with user accounts that require Azure AD Two-factor Authentication (2FA). What do I need for this approach? Azure AD domain name. This requirement is already listed in the prerequisite of this article. Azure AD tenant ID. This requirement is already listed in the prerequisite of this article. Create and configure an Azure AD native application for end-user authentication with Data Lake Storage Gen1 using Azure Active Directory. For instructions, see Create an Azure AD application. See Get the application ID to retrieve the application ID. 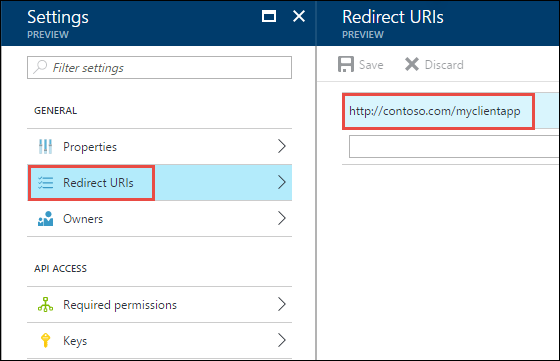 To retrieve the redirect URI, do the following steps. 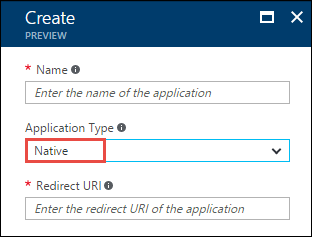 From the Azure portal, select Azure Active Directory, click App registrations, and then find and click the Azure AD native application that you created. From the Settings blade for the application, click Redirect URIs. From the Settings blade for the application, click Required permissions, and then click Add. In the Add API Access blade, click Select an API, click Azure Data Lake, and then click Select. In the Add API Access blade, click Select permissions, select the check box to give Full access to Data Lake Store, and then click Select. Repeat the last two steps to grant permissions for Windows Azure Service Management API as well. 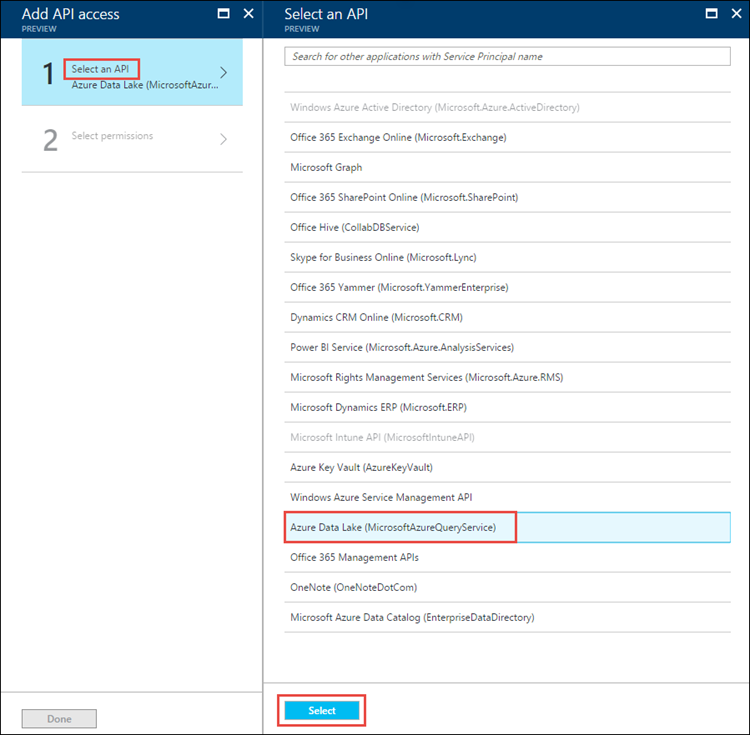 In this article, you created an Azure AD native application and gathered the information you need in your client applications that you author using .NET SDK, Java SDK, REST API, etc. You can now proceed to the following articles that talk about how to use the Azure AD web application to first authenticate with Data Lake Storage Gen1 and then perform other operations on the store.